BHASVIC Chem Soc was delighted to welcome Professor Wendy Brown from Sussex University to talk about her research. An impressive number of students managed to squeeze into lab 27 to hear about the Interstellar medium and radical reactions on dust grains. Wendy also discussed the range of degree courses and possible future careers open to chemists. 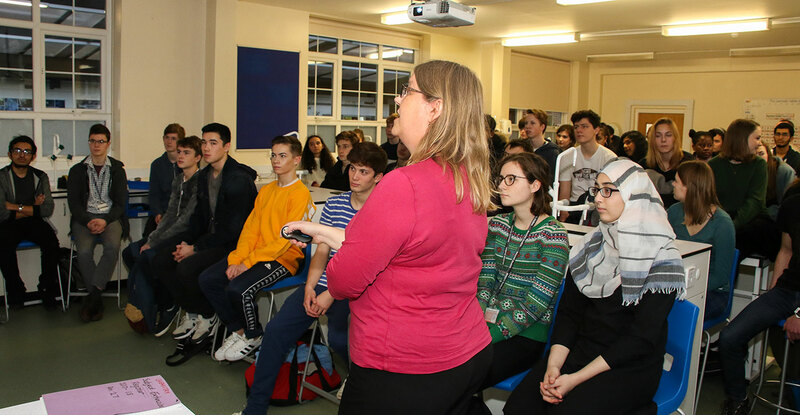 Both A1 and A2 students stayed behind to ask individual questions about the talk, undergraduate study or further research. We will be taking a group of students to Sussex University later this academic year to use their amazing laboratory facilities. This event was a great success and nicely complements the extra-curricular practical work, Chemistry Competitions and Flammability research project which are the weekly fare of Chem Soc. Chem Soc is on each week on Wednesday from 3.50 - 4.50.